$38.76 total spent – YES = one happy momma :-D!!! So – it’s not that the bathroom was horrible. It was great six (or eight?) years ago when my sister-in-law redid the bathroom for my mom. It was cute for all the grandkids. 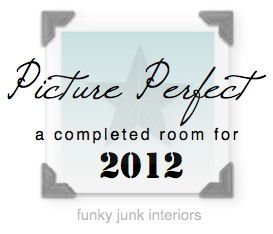 I’m linking up to Donna’s Picture Perfect Completed room for 201.